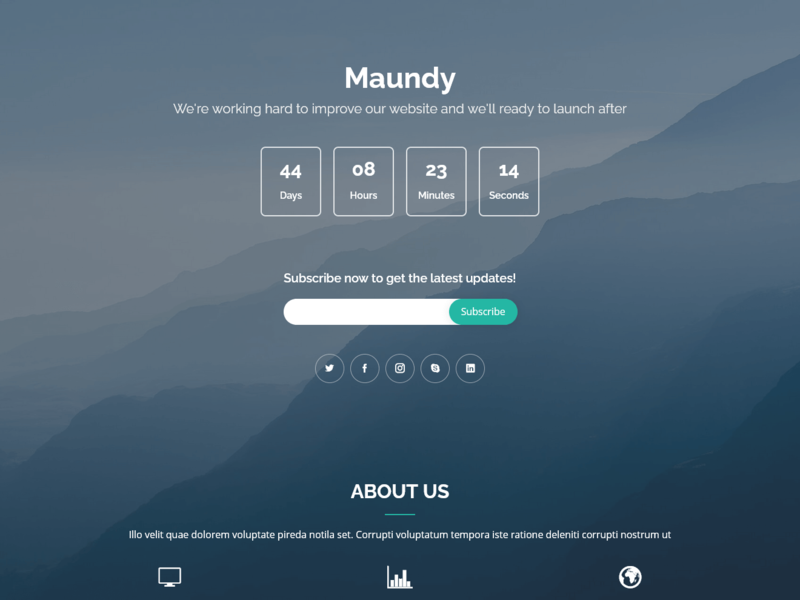 Maundy is a free coming soon template built in bootstrap framework. It is fully responsive, elegant, simple, clean and mobile friendly bootstrap coming soon template. This template is based on HTML5, CSS3 and latest bootstrap framework with multi browser and any device support. This free coming soon template template packed with fully features and contains many features with a minimal outlooks. This template contain countdown timer and an about section where you can add information about your team members, company, group and more. It is easy to customize free bootstrap coming soon template. This template is perfect use for every creative people, e-commerce, corporate, agency, business, portfolio and much more. This coming template is create for those who want minimalist coming soon page, and for those who want to display product information until their website is complete.